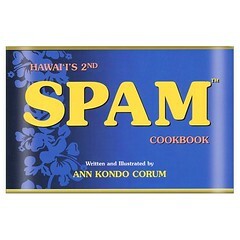 When I lived in Hawai'i, I learned that the Spam and Hawai'i connection was not a myth. The Safeway in Kona had the largest Spam section I have ever seen. Who knew there were so many varieties? I think, though, that I only ate Spam once while I was there. It was part of a local dish, and I didn't mind it. Hey, it was fried. What's there not to like about something fried? 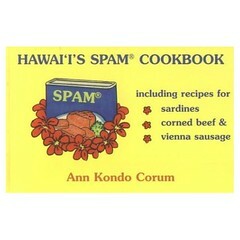 So, when you're at Whole Foods and reaching for the Spam, don't forget about Ann Corum's cookbooks. They may be the saving grace for your next wine, cheese, and canned meat party. 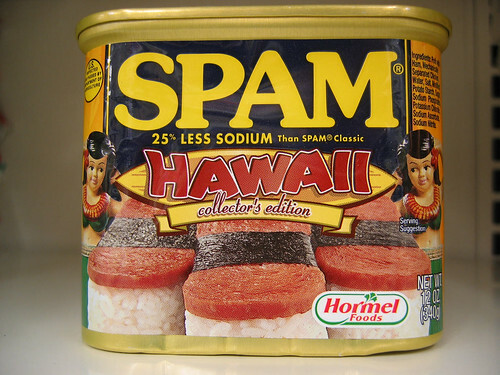 Spam's maker, Hormel Foods Corp., reported last week that it saw strong sales of Spam in the second quarter, helping push up its profits 14 percent. According to sales information coming from Hormel, provided by The Nielsen Co., Spam sales were up 10.6 percent in the 12-week period ending May 3, compared to last year. In the last 24 weeks, sales were up nearly 9 percent. The Austin, Minn.-based company, also known for the Jennie-O Turkey Store, has embarked on its first national advertising campaign for the 71-year-old brand in several years. They've credited the sales increase to that, along with new products like individually packaged "Spam Singles" slices. Also helping sales, executives said in an earnings conference call, was the fact that people looking to save money are skipping restaurant meals and eating more at home. I surprised that you never had Spam Sushi while you lived in Hawaii.